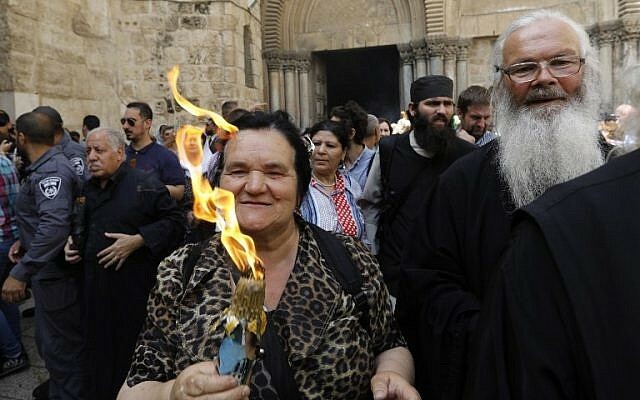 With candles in hand, at least seven thousand pilgrims filled the Church of the Holy Sepulchre, according to police spokesman Micky Rosenfeld. 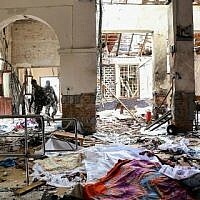 The church is built on the site where according to Christian tradition Jesus was crucified, buried and resurrected. 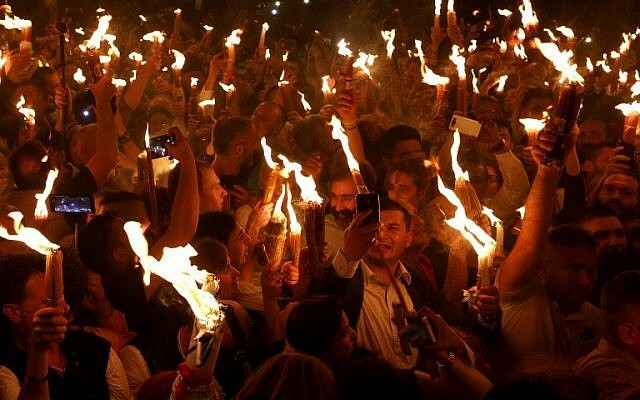 Thousands more stood in the square outside to receive the flame, representing the resurrection of Jesus, which passed from candle to candle and will be taken back to Orthodox churches worldwide. The ceremony is the holiest event for Orthodox Christianity. 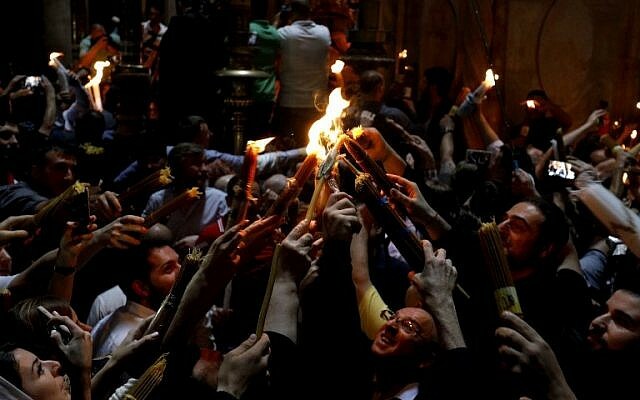 In a ritual dating back at least 1,200 years, worshipers crowded into the church. 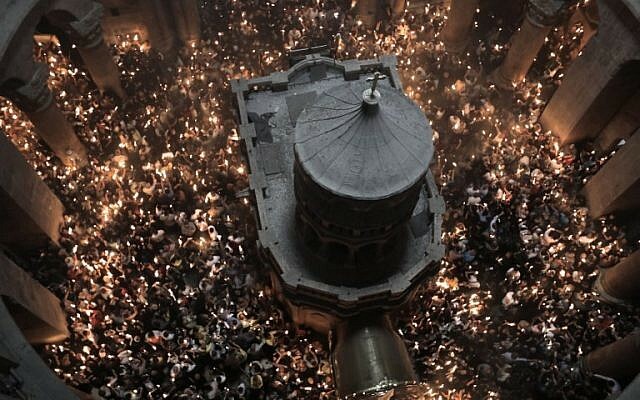 During the annual ceremony, top Eastern Orthodox clerics enter the Edicule, the small chamber marking the site of Jesus’s tomb. They then emerge to reveal candles said to be miraculously lit with “holy fire” as a message to the faithful from heaven. The details of the flame’s source are a closely guarded secret. Orthodox Christians will celebrate Easter on Sunday. 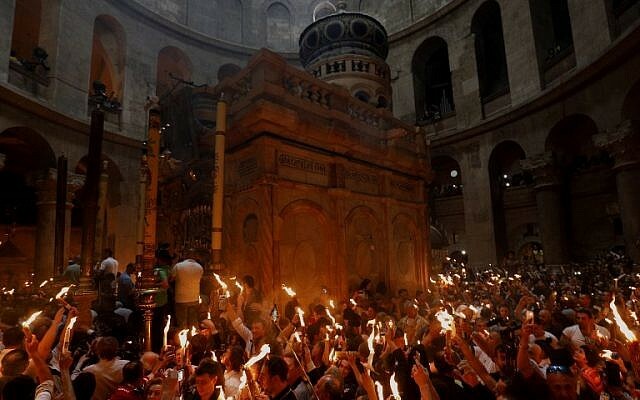 The Church of the Holy Sepulchre and the rest of the Old City lies in east Jerusalem, captured by Israel from its Jordanian occupiers in the Six Day War of 1967 and later annexed by Israel. Christians made up more than 18 percent of the population of the Holy Land when Israel was founded in 1948, but now form less than two percent, mostly Orthodox. Israeli police, which secure the event, said it took place without any disturbances.